If, like Scurvy Jane, you are spending more than you are making, then it’s time to rein in your spending. Start by taking baby steps and cut back on what you don’t need. Scurvy Jane has been working on the abacus and trying to make sense of her tax returns. As a realist, she understands that sometimes, some real tough decisions have to be made. 10 Responses to If, like Scurvy Jane, you are spending more than you are making, then it’s time to rein in your spending. Start by taking baby steps and cut back on what you don’t need. Nice to know what happened to the prom night dumpster baby. Bill Y is all about public awareness. If you name them and keep them all, think of the tax deductions! Does this also work for imaginary kids? Oh Bill Y, this might be the best bargain in the bin! 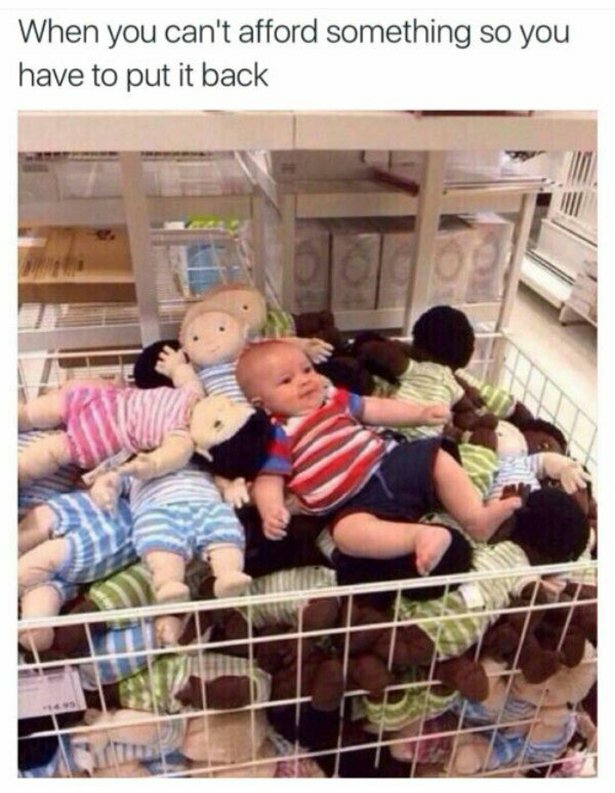 How does one not buy that doll? Al I know is that my model of parenting is a hell of a lot cheaper, Don Don’s! Awww. ANOTHER cute baby! I can’t bear it. I know, I think I need a check-up. That’s about the most expensive thing a person could put in their cart. I reckon that’s why it was put back!